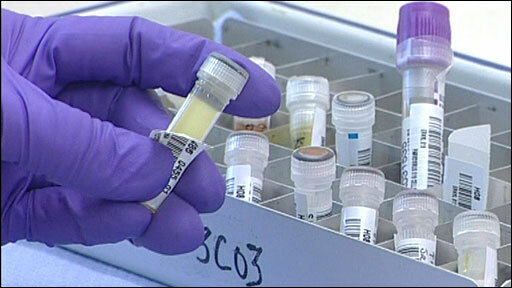 BBC medical correspondent Fergus Walsh visits the laboratory that confirms measles cases for the whole of the UK. Measles cases in England and Wales have topped 1,000 in a year for the first time in more than a decade, Health Protection Agency figures show. In the first 10 months of 2008 there were 1,049 cases, more than in the whole of 2007, the agency said. It said measles was spreading more easily because of the low uptake of the combined MMR jab over the past decade. In Cheshire, an outbreak of more than 60 cases has prompted the launch of a programme to vaccinate 10,000 pupils. The decade of relatively low vaccination coverage was triggered by now-debunked research claims of a link between the combined measles, mumps and rubella jab and autism. Public health experts say the growing number of children who are unprotected - about 3m or one in four have not had both MMR doses - means there is a real risk of an epidemic. It is estimated this could result in between 30,000 and 100,000 cases of measles in England alone. Although MMR coverage is higher in Scotland and Northern Ireland, experts said an epidemic could affect children anywhere. Dr Mary Ramsay, an immunisation expert at the Health Protection Agency, said: "Over the last few years we have seen an unprecedented increase in measles cases and we are still receiving reports of cases across the country. "The 1,049 figure is the highest number of measles cases recorded in England and Wales since the current method of monitoring the disease was introduced in 1995. "This rise is due to relatively low MMR vaccine uptake over the past decade and there are now a large number of children who are not fully vaccinated with MMR. "This means that measles is spreading easily among unvaccinated children. There is now a real risk of a large measles epidemic. "These children are susceptible to not only measles but to mumps and rubella as well." Dr David Salisbury, the government's head of immunisation, said: "This is something we have worried about for a considerable period of time. "We saw a lot of measles in London, we are now seeing it spreading further around the rest of the country. "Measles is about the most infectious virus we know. It just spreads like wildfire." In central and eastern Cheshire, health officials are so concerned about their outbreak of cases that they are embarking on a mass vaccination programme. More than 10,000 children are being offered the MMR jab by teams of nurses who will visit primary and secondary schools in the next few weeks. Vaccination will not take place without the consent of parents. A measles vaccine was introduced in the late 1960s, followed by the three-in-one MMR jab in 1988. Although most children recover fully from measles, it can be a serious illness. One in 10 cases requires hospital treatment and it can lead to pneumonia, brain damage and even death. In 1965 there were 115 deaths from measles, but the rates fell off dramatically after the introduction of the vaccine. Joff McGill, of the rubella charity Sense stressed that it was also vital that children received MMR to protect them against rubella (also known as German measles), a disease which if contracted by a woman while pregnant can leave her baby deaf and blind. Dr Patricia Hamilton, President, Royal College of Paediatrics and Child Health said the latest figures were "very worrying". "We cannot stress too strongly that all children and young people should have the MMR vaccine. "Overwhelming scientific evidence shows that the vaccine is safe. Measles can have very serious effects."